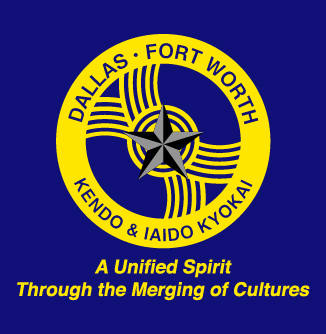 The philosophy of the Dallas/Fort Worth Kendo & Iaido Kyokai is represented by our mon or logo. This mon symbolizes a path to a unified spirit, growing strong through the diversity of cultures our group represents. The lines converging on the Lone Star represent the merging of our members’ diverse backgrounds, while the Lone Star itself symbolizes the strong spirit and individual growth offered by the way of the sword. Every member contributes in his or her own way to our common goals. The mental and spiritual development of one’s self is as important and perhaps more important than the physical training. The purpose of practicing Kendo is to mold the mind and body, to cultivate a vigorous spirit, and through correct and rigid training, to strive the improvement in the art of Kendo, to hold in esteem human courtesy and honor, to associate with others with sincerity, and to forever pursue the cultivation of one’s self. Thus one will be able to love his/her country and society, to contribute to the development of culture, and to promote peace and prosperity among all peoples.